c. the area of Biar Jaqub was better specified by the discovery of, in all, 149 important sites (not speaking of about 700 additional observations such as the identification of ancient road-signs). See list at the end of this report. 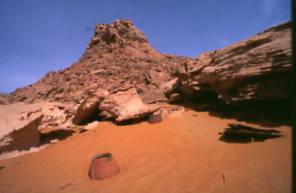 My discoveries of the Tariq Abu Ballas (TAB), of Djedefre´s Water-mountain (DWM) and of Biar Jaqub in the field-seasons of winter 1999 – 2003 brought to light, that (contrary to traditional thought in Egyptology) vast stretches of the desert southwest of Dakhla Oasis were not a fearful void in ancient times, but an expanse that had been successfully traversed by Old Kingdom donkey caravans on their way to the Gilf Kebir and, further, to the Tschad Basin. In addition, in this empty sphere a “lost” oasis situated in two days marching distance from Dakhla Oasis was identified; a striking evidence that at least up to the beginning of historical times (and even later on) this part of the Libyan Desert had been the home of an unknown number of oasis dwellers. The discovery of Biar Jaqub made clear, that rumors about the existance of a “lost” oasis (Zerzura) reported by Wilkinson in 1835 had a real base, and that native narrative should be thoroughly checked in the field before being put aside as mere fairy-tale. 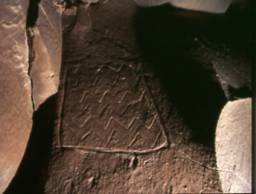 In 1990, not just a rumor but an astonishing “hard fact” was reported from a site 28 km south-southwest of Mut, where Mrs. Walli Lama of Lama Expeditions (Frankfurt) had discovered an early Middle Kingdom inscription of a high official named Mery. The translation reads: “In the year 23 of the Kingdom: the steward Mery, he goes up to meet the oasis-dwellers.” (Translation by Günther Burkard, University Munich). Later, it turned out that the site had been an ancient station on the TAB. Were the “oasis dwellers” of Biar Jaqub the ones whom Mery wanted to meet? The 440 km long leg of the TAB so far discovered, leads from the late Old Kingdom oasis capital Balat (situated in the eastern section of Dakhla Oasis) in southwesternly direction via Mery´s rock and Muhattah Jaqub to Abu Ballas Pottery Hill and further on to the Gilf Kebir, where the ancient caravan road traverses the plateau. It descents from it into a subsidary of Wadi el Akhdar. DWM is situated about 60 km north of the TAB. As far as examined until winter 2002/3 Biar Jaqub itself is stretching from DWM for about 8,5 km towards the south-southwest. Would southern “outscirts” (if they ever had existed) of this not yet fully examined “lost” oasis get into the reach of the TAB or even touch it? As it is hard to comprehend that Biar Jaqub once upon a time was an isolated oasis and, therefore, void of any continuous contacts with the outside world: How was Biar Jaqub connected with the TAB, how with Dakhla Oasis? Could traces of road links still be detected? These were the questions to be answered in winter 2003/4. On the first excursion I was accompanied by Marlies Kriegler, a young Austrian student of meteorology. We had to cope with tremendous heat. 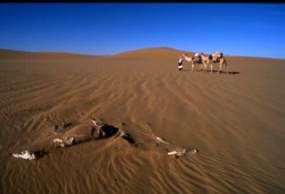 Our two camels were sweating severely and, shortly after the start Marlies suffered from dehydration. 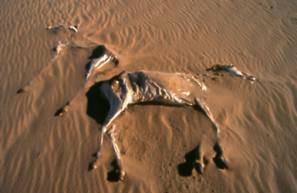 Water consumption for humans and animals was high. Despite of these difficulties we succeeded in finding a line of road-signs (alamat) leading from DWM to the east. The alamat led us to a small flat-topped hill of about 6 metres in height. 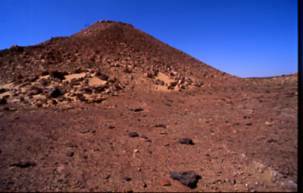 At this hill a quite comfortable road-station (Muhattah equipped with a large grinding plate) had been set up, most certainly dating to 4th dynasty times. The Muhattah is situated 13,2 km east of DWM. This distance lies comfortably within the scope of travel-ranges, that has been found appropriate for a one day march pensum of heavily loaded donkeys on the TAB. I christened the road “Tariq Khufu” (TK) and the station (according to the name of a scribe of Khufu´s expeditions) Muhattah Bebi (MB). 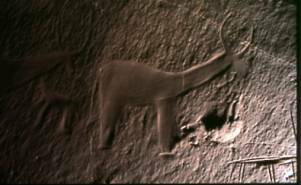 Probably, the TK had been used by at least two Cheops-expeditions whose written records I discovered on 9th Dec 2000 at DWM. About 1 km north of MB another line of old alamat streches from west to east, indicating that the area of DWM was connected with Dakhla by yet another ancient road. Until present no Muhattah has been found on this trail. Because of the heat we could not follow the 2 roads further to the east. After replenishing our supplies at a water-dump, we investigated a hitherto untouched strech of land south of DWM. 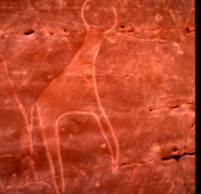 In this area 7 rock-art sites were discovered bearing images of animals and of steatopygeous female figures. One of the sites bears 3 extremly large representations of such individuals or godesses, their heads being adorned with elaborated hairdresses. 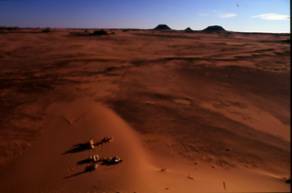 These are figures which Hans A. Winkler attributes to a civilization defined as “Early oasis dwellers”. On returning from the southern vicinities of Biar Jaqub to DWM we came across a flat pale-gray rock topped with 3 stone circles. 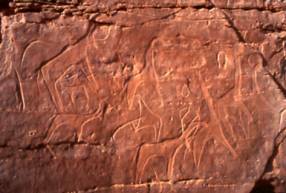 It´s northern rock face is decorated with a few severely eroded petroglyphs, a few pieces of Sheikh Muftah pottery laying below at the foot of the rock-art. On all but it´s western flank simple stone constructions had been errected for storage (Khasin) and shelter. The site lies 13,2 km south-southeast of DWM. This is exactly the same distance as found for MB a few days before. Some well preserved pieces of pottery of the Abu Ballas-type in one of the Khasins belonging to not more than one jar made clear, that the site had been used as a Muhattah during the end of the Old Kingdom. Surprisingly, into a few of the potsherds holes had been drilled. Therefore, the jar could not have been used as a water container. Most probably it functioned as a food-storage. I christened the site in reference to a name found at DWM “Muhattah Sa-Wadjet” (MSW). Was the site selected accidentally or was it chosen on purpose? The distance of 13,2 km is startling. Were was the road? 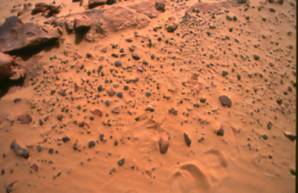 The terrain is sand covered. Finally we found a line of Alamat that led us north to DWM. Would there also be a leg of a trail leading from MSW further to the south? On 19th November I set out with Johannes Kieninger, Germany, and two camels for a second excursion. The heat had vanished. Comfortable weather conditions led to a burst of discoveries. 2,6 km south of DWM we located a stone circle settlement consisting of 19 structures of stone slabs, obviously representing the remains of huts, the 20th having been erected in their center and marked with distinct cuts of copper(?)-tools. On a neighbouring conical hill a number of stone constructions that might have served some astronomical purpose were observed. Not far away from the settlement two water-mountain symbols next to a steatopygeous female figure were found on a rockface. 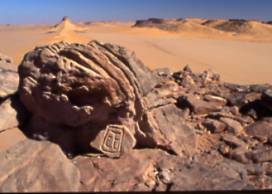 Most likely, one of the water-mountain symbols is a variant of the water-hole hieroglyph (the upper row of water-signs uniting, left and right, with the tops of the “container” walls); it also resembles the water-hole symbol connected with a hieroglyphic inscription of Mery, which was discovered by the French mission in the vicinity of Tineida (Dakhla-East). On the surrounding hills further, smaller sized stone circle settlements as well as a number of rock-art sites were detected. A few hundred metres west about 1 sqkm of settlement-debris (fire places, bones, ostrich egg-shells, small pieces of pottery, numerous grinding stones etc.) stretches north to south. At the western fringes of this area we found a rock face (at high altitude of a hill) with depictions of 3 water-mountain symbols. One of the symbols is of the same kind as the one described above. This group of sites accounts for the “population center” of Biar Jaqub. According to the number of “house structures” and the like it seems most probable, that once upon a time about 200 people had dwelled here. One might ask: Why such a densly populated area at this place? 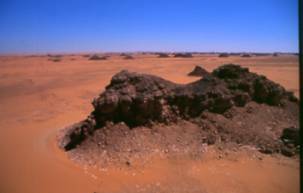 The sites are situated at the western outskirts of a large playa; a fertile area that would have been a suitable environment for collecting plants and for early forms of oasis agriculture. However, no depictions of such agricultural activities (as discovered at DWM) were detected around the field temple. 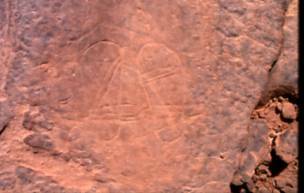 Later, on the 3rd expedition, 1,5 km to the south-southeast of the cult place, two additional rock-art sites (one adorned with a representation of a “snake-dancer”) and another stone circle settlement on a flat-topped hill 1,5 km to the east of the field temple were found at the fringes of the same large playa. To make the wonder complete, we came across a line of alamat leading from the “population center” to the east (probably to Mut el-Kharab). We followed the signs for 19 km. This leg of an old trail attests for a second road between Biar Jaqub and Dakhla Oasis. 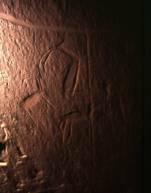 Last but not least, on the 4th expedition, a depiction representing a fowling place was found in the vicinity of the field temple. 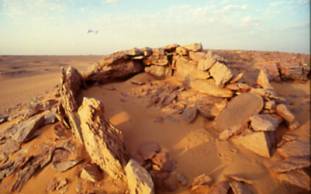 The discovery of the center of Biar Jaqub brings into balance several “indicators”: the number of wells, stretches of playa and the population “needed” to account for a place of “the oasis dwellers” in the late predynastic period as well as in early dynastic and later times. 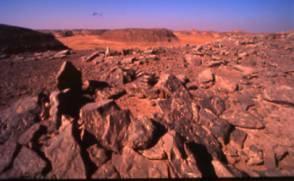 Eight kilometres further to the south-southwest, in the neighborhood of MSW, we identified an area at the banks of a shallow wadi, where (at three rock-art sites) pottery (with white “inlays”) was found. Surprisingly, the pottery consisted only of “kitchen-ware”. Not a single water jar or pieces thereof were found. Would a natural water-source not have existed in that region in ancient times, we would most certainly have come across such remains. 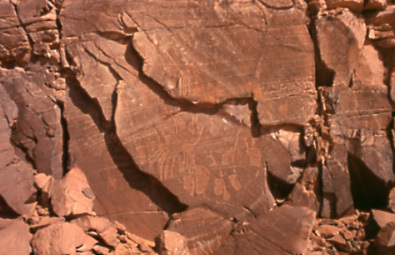 Among the rock-art were representations of a donkey(? ), of sandals and of sheep. One of the constitutive elements of a florishing oasis is the fact, that it should be connected with more than one destination of the outside world. In addition to the segments of two roads leading to Dakhla (TK etc.) we found traces of a hitherto unknown trail leading from Biar Jaqub to Muhattah Jaqub on the TAB. When leaving the most southern outskirts of Biar Jaqub, we soon came across a hillock marked with an alam. 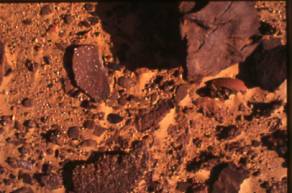 A cave-like overhang on it´s eastern side contained fragments of an early-dynastic Claytonring. In persueing our advance to the south, we soon found ourselves walking on 15 thin lines of a donkey trail. After a while the grooves faded away. While still on them we had come across a double-line of stones, 30m long (similar to those found along the TAB) and in rectangular position to the ancient road. We followed the direction indicated by the road fragments and finally arrived at a small depression (Wadi Johannes; WJ). On two hills in WJ stone circle settlements were found, the bigger one of the two containing grinding tools. On a rock face on the southern side of the settlement-hill a depiction of a big steatopygeous female figure was discovered. From this evidence I concluded, that the depression could have been the most southern outskirt of Biar Jaqub. We searched in vain for a water-mountain symbol, a well or a spring. Finally, an alam led us to a deep hollow close by, a location which might have harboured a water-source in former times. 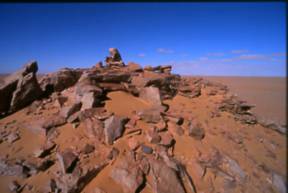 The site is 38,8 km away from DWM and 25,2 km from Muhattah Jaqub on the TAB. Looking from the settlement-hill to the south one can make out three prominent features: a pyramid-shaped hill enfiladed by two rectangular formed black elevations. Not surprisingly, the “pyramid” is crowned with an alam. At it´s foot a windscreen had been erected. Climbing on top of the “pyramid” a conspicuous hill is seen far away in the south. This hill I already knew. It is a noticeable landmark situated only 0,5 km north of Muhattah Jaqub. All landmarks, road fragments and alamat to the north and to the south of WJ are in alignment with each other. Leaving the “pyramid” and passing another alam on top of a low but prominent hill, we came to a small resting place for caravans. 11.9 km before reaching Muhattah Jaqub, we stood in silence at the lee-side of a pyramid-shaped hill and overlooked a wind-eroded terrain with scatters of Abu Ballas-type pottery as well as of greyish/brown pot-sherds with sparkling white “inlays”, fragments all too familiar to us as, just a few days ago, Johannes had discovered two large pieces of such pottery forming a bowl at shallow wadi. We had arrived at an important Muhattah which, most certainly, had served as a resting place for the “oasis dwellers” of Biar Jaqub on their way to Muhattah Jaqub. In reference to a name-fragment at DWM I christened the site “Muhattah Ikepi” (MI). There is a natural cleft of about a man´s height and a man´s width on the lee side of MI. This fissure is almost 3m deep. Could it have been used for suspending water-girbas that, if laid on the ground, would have lost their fill rapidly due to the effects of osmosis? In front of the crack one still can see fragments of formerly errected stone constructions. Within and around these constructions the pot-sherds are scattered. Because of the two different kinds of china there can be no doubt that MI, laying almost half way between WJ and Muhattah Jaqub, had something to do with activities of refilling the water jars on the TAB. 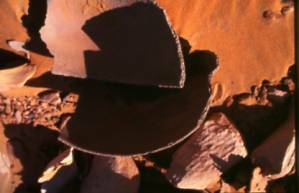 Erosion, over time, has caused severe destruction of the pot-sherds. No traces of recent visitors to be seen. But, most important, the fragments of Biar Jaqub-type pottery give proof, that along this trail movements of the “oasis dwellers” once had taken place. I named the trail “Tariq el ma´a – the road of the water” (TM). Proceeding on our way to Muhattah Jaqub we passed two alamat at the midway-point (after 6 km). The scanty installation of road-signs on the TM sharply contrasts with the elaborate setup of alamat on the TAB, suggesting that the ones who had walked along the TM, had been at home in the landscape which they traversed, while others heading for the Gilf Kebir and for the Tschad-Basin, could have been strangers (Persons chosen at random by the oasis governor, travellers or merchants who were not well aquainted with desert travel?) who were in need of more “guidance” when traversing the vast void. Almost all the pottery at Muhattah Jaqub, approx. 120 jars and a few pieces of “kitchen eqipment”, which I had discovered on March 5th 1999, were collected by archaeologists and stored in a magazine at Balat, Dakhla Oasis. The “kitchen pottery” consisted mainly of a firmly walled, well fired coop of anthracite/red-brown colour. 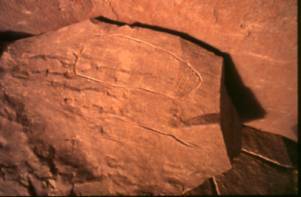 The object has a clearly defined rim and measures about 55 cm in diameter. It is very distinct from all other pottery but not of the same kind as the pot-sherds of the Biar Jaqub-type discovered at shallow wadi. I had found the coop on a shelf at the foot of the fall of rock about 5 m above the desert ground. It was broken into a handful of pieces and lay next to two semi-circles of stone slabs, which are attached to the base of the steep rock. The latter indicate temporary occupation and, possibly, represent a kitchen. This opinion is supported by the fact that, as at a few other Muhattahs on the TAB, such “high altitude-locations” for kitchens were probably chosen to avoid the spoiling of food by dust and sanddrift while cooking and eating during the time of Khamsin. 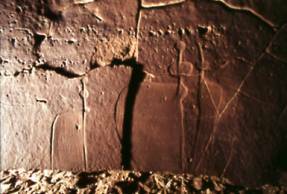 A few spans east of the “kitchen” three “calendars”, sets of short vertikal notches, are scratched into the rock. As if people, who had been ordered to hold out at the site, had counted the days of their exile. To add some ease to their difficulties, the same administration that had organized the transport of the water jars from Dakhla Oasis to Muhattah Jaqub, to Abu Ballas and to other Muhattahs during the 6th Dynasty, might have ordered the delivery of the firm coop for the convenience of those, who had to endure hardship at this lonely destination. 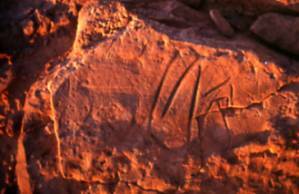 These individuals left no traces of writing at the rock-faces. However, an enigmatic ornament possibly representing a head-rest or a spiral was found at the eastern end of the shelf. And on the hilltop a sandstone slab covered with a puzzling arrangement of crude lines surrounded by a cartouche(?) was stored in an alam, which had collapsed centuries ago. The rock-drawing has close resemblance with my initials. Is this an attempt by illiterate “oasis dwellers” to entrust a name to the rock, so that it would outlast the passage of time? The two illustrations are the only works of art that could be attributed to their presence. 1. The road adds additional proof to the fact that Bair Jaqub once was an oasis. That this oasis existed in historical times, is attested by finds of Abu Ballas-type pottery at shallow wadi and at MI. Greek(?) 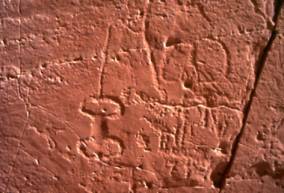 graffiti discovered within the reaches of the oasis substantiate the view that Wilkinson´s 2nd Zerzura “florished” well into Ptolemaic times. After the wells had fallen dry the notion of a “lost” oasis prevailed. It was handed down by native narrative from one generation to the next until, in 1835, it was recorded by Wilkinson. 2. Surprisingly, only “kitchen-ware”, not a single water jar or pieces thereof were found in Biar Jaqub. 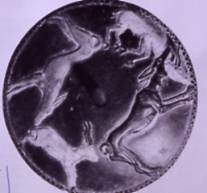 This alone is an indication that during an unknown period in the past Wilkinson´s 2nd Zerzura was carrying water. 3. The TM (tariq el ma´a) cannot be considered to be a side-track of the TAB. Over a distance of 440 km the alignment of the Muhattahs on the TAB deviates only by one or two degrees. This not only demonstrates, that precise navigation during Old Kingdom times was profoundly exercised by up to date unknown methods, but also that there was obviously no incentive to depart from the straight line. The hardship of travel did not allow for angling away into the unknown or to leave the beaten track for adjacent destinations. Under the circumstances of desert travel such behaviour is nothing more than a matter of common sense. 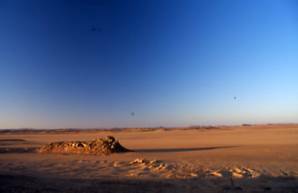 DWM and Biar Jaqub are situated in three days marching distance west-southwest of Dakhla. The distance between DWM and Muhattah Jaqub is 63,2 km due south, the southernmost water-bearing(?) depression of Biar Jaqub being 38,8 km north of the muhattah. Even nowadays long distance desert travellers bearing the burden of walking and of driving pack animals would aim directly for their destination (when heading for the Gilf Kebir), therefore, following the hypotenuse-line of an almost rectangular triangle instead of keeping to its cathetes. 4. Whatever “the oasis-dwellers” carried on their donkeys along the TM, it could have been nothing but water. Most probably were the inhabitants of Biar Jaqub the ones, who were employed by the Egyptians to refill the jugs belonging to the jar-deposits along the TAB. Accordingly, the TM was the water-supply route for Muhattah Jaqub. 5. 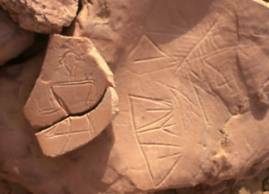 The discovery of the TM and of the afore mentioned pottery sites puts the Middle Kingdom inscription “the steward Mery, he goes up to meet the oasis-dwellers” into a new light. Obviously, Mery knew what he was up to. He did not convey to us, that he was going directly to an oasis but that he was going to meet people. Most probably, such a meeting took place outside a permanently inhabited area (otherwise the location would have been mentioned) at a site such as Muhattah Jaqub, to which the TAB as well as the TM are leading. To refill the jars deposited not only at Muhattah Jaqub but also at neighbouring water-storage places, would have afforded many days of work and would have involved quite a number of donkeys and men. Therefore, it seems probable that a small party of men stayed at Muhattah Jaqub during the period of water-refillment as attested by the “kitchen” and the “calendars”. These men were involved in carrying the water to neighbouring Muhattahs (e.g. Muhattah Umm el Alamat), while another party of “oasis dwellers” fetched the liquid supplies from Biar Jaqub via the TM. 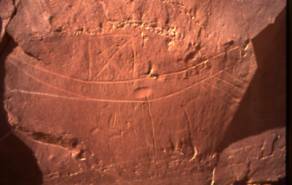 The Mery-inscription therefore could be interpreted as a statement, that the steward was on an “inspection tour” to make sure that all the jars at Muhattah Jaqub and it´s neighbouring deposits were filled properly by the “oasis-dwellers”. 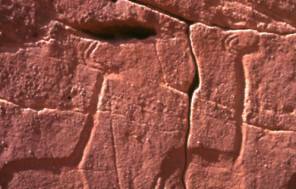 In any case, Mery´s inscription is the first written evidence from pharaonic times suggesting, that a hitherto unknown oasis outside the Dakhla-Depression had existed somewhere in the west. 6. 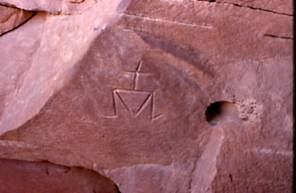 There is reason to believe, that the steward Mery of the above inscription is identical with the Mery of an inscription found by the French mission at Tineida (Dakhla-East). The latter text narrates the achievement of establishing a cistern or a pond in a barren invironment. Mery´s “affinity with water” suggests, that he could have been an expert, who had specialised in erecting places for water-supplies and provisions as well as organizing their refillment. That such duties had always been of great concern for the ancient oasis administration, became obvious when the French excavation at Ain Asyl discovered a number of clay tablets. One of them bears a complaint that the pottery intended to prepare the way for the governor had not yet arrived at its destination. 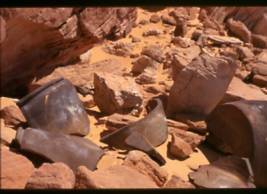 The pots were assigned to serve to transport provisions for a longer desert journey. 7. Prior the discovery of the TAB the idea had been advocated, that Abu Ballas Pottery Hill was approached by ancient caravans without touching intermediate restplaces. After a number of these restplaces had been found, the idea of a “three-donkey-supply system” to provide the TAB-Muhattahs with water was put forward. The theory runs as follows: A caravan of three (thirty, threehundred etc.) donkeys plus drivers leaves from Dakhla for the southwest. Arriving at the first station one donkey-load is dumped. The disburdened beast returns to Dakhla, while the two others continue their march. On reaching the next station the second donkey is unburdened. He returns to Dakhla empty loaded. On his way back he finds enough water and provisions dumped at the first station to complete his safe return to the oasis. The third donkey advances to the third station and dumps his load there. On his return to Dakhla he consumes parts of the supplies stored at the second and at the first station. 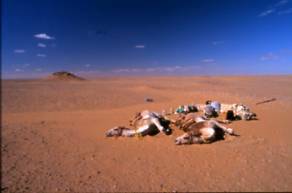 The author of this theory believes, that such a sophisticated procedure could be continued unlimitedly, therefore, making it possible to establish a line of depots across waterless stretches of the Libyan Desert being hundreds of kilometres long. As elaborate as this theory is, it does not reflect the distribution of jars discovered in the field. So far, only two main deposits on the TAB have been identified: Muhattah Jaqub and Abu Ballas. All other water dumps consist of considerably less jars and pot-sherds. Moreover, southwest of Abu Ballas the setup of deposits becomes erratic. 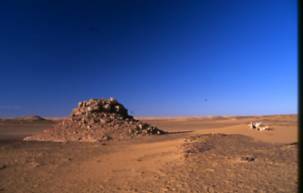 A sequent supply of the Muhattahs from a single source originating in Dakhla would call for a distribution of jars much different from what has been found in the desert. Thanks to the existance of Biar Jaqub the ancient water-supply scheme was much more simple. There is yet another supply-strategy to be considered, when contemplating about the setup of ancient water- and provision dumps deep in the desert. In “Thousand-and-one Night” a loading-scheme for a 40 days journey across the fearful void adviced Musa Ibn Nusair to load 1000 camels with water-girbas, 1000 with provisions and 1000 with jars. Carrying pottery along deemed necessary, as hot winds from the south would dry out the girbas. For that reason Musa was cautioned to store water-supplies in earthenware. Most probably, the 1001-night story is based on real observations however, passing from mouth to mouth, from camel drivers to city-folks alien to the desert, the hard facts about water-storage in the barren lands obviously became distorted. 8. As attested by the find of Ptolemaic period pottery in a deposit of the TAB and of Roman(?) graffiti discovered in Biar Jaqub, the supply of water from Wilkinsons 2nd Zerzura via TM may have functioned well into Roman times. 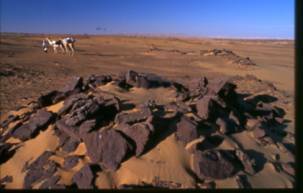 Then, because of the greater reach of camels, probably only a few muhattahs on the TAB were needed and maintained (e.g. a Muhattah in the vicinity of Khasin el-Ali). Most likely, the TAB had been in use at least as long as water could be obtained from Biar Jaqub. What has been attested by archaeological research so far, is the fact that the TAB had been in continuous use for over more than 2.000 years (from 6th dynasty until the beginning of the Christian era). 9. As Wilkinson quotes the existance of “another wadi”, one might guess that the jar-deposit at Abu Ballas was refilled with precious liquid from yet another “lost” oasis. Traces of pottery marking a route to such a destination have already been found by the author. 10. The argument that depots of water jars at more than 30 stations on the TAB almost rule out the existance of any intermediate oasis on the route to the Gilf Kebir/Gebel Uweinat, for if one had been there, the expensive maintenance of Muhattahs over a 400km long stretch of desert would have been pointless, has lost it´s persuasive power. Such criticism does not acknowledge the evident rectilineal-oriented “urge” of the ancients to reach their final, far away destination. It also does not take into account a logistic system that, most certainly, provided provisions and replenishments not only from the starting-point of the TAB but also from it´s “flanks” (from a “lateral area of supply”). 11. The existance of a “lateral axis of supply” extenuates another critical appraisal. Taking into account that the vessels found at most Muhattahs are remarkable few, this critique rules out, that Egyptian caravans used the TAB engaging in “trans-Saharian” mining or trade expeditions. If, however, (constant or periodical) replenishment of water had taken place “from the flanks” of the TAB, the number of jars at most deposits would have been absolutely sufficient (The volume of 100 ovoid pots accounts for about 3.000 litres). Moreover, these well-fired jars could have been used over a long period of time. 12. 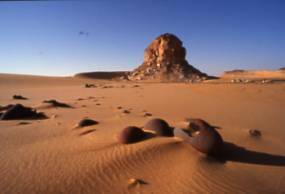 The discoveries made in Biar Jaqub and the identification of a water-supply route to Muhattah Jaqub (TM) substanciate the conception, that Wilkinson´s 2nd Zerzura once was an important location for sustaining long-distance travel in ancient times. For reasons of combing hitherto unexplored land we choose a different course on our way back to Biar Jaqub. Soon we crossed an old trail, which lead from the “pyramid” to the south-southwest and, later, we passed a neolithic dwelling at a rock, where I detected a petrified jaw of a hyena half-covered by a grinding plate. Heading north, a few singular stone circles were observed until, 15,8 km south-southwest of DWM, I came across a small rocky hill at the northern end of a playa pan on my midday walk. It´s rock-faces are adorned with numerous steatopygeous female figures, their different dresses and “haircuts” offering quite a glimpse at the fashion-of-the-day at the end of the neolithic period. On this expedition I was accompanied by my girlfriend, Janine El-Saghir, who made a last minute decision to join. So, as in case of the two journeys before, the expenses of the trip could be shared. We spent about a week on photographic documentation of the sites discovered during the previous surveys. We also revisited a rockface at a hill which I had discovered on February 11th 2002. It is adorned with a representation of 4 Bohar Reedbucks facing a water-mountain symbol. Bohar Reedbucks are distributed throughout the Sahel and are likely for Egypt during the early Holocene (C.-S.Churcher). They also live in Tansania. In the latter region they prefer swamp-like or, at least, moist invironments. Would, therefore, the sole combination of a water-mountain symbol with animals of this species account for a moist habitat, for a spring or a well in the vicinity of the site? Would such a habitat have prevailed in Biar Jaqub until the end of the neolithic period? 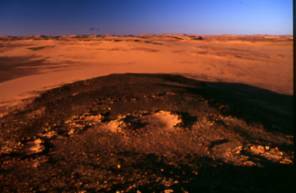 Experts like Toni Mills (Dakhla Archaeological Project) are sceptical. The archaeologist supposes that the representation of a single species at a water-mountain site is a mere coincidence and not a proof for anything, particularly a specific habitat. 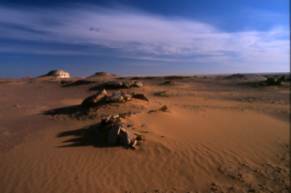 However, even at present, swamps and a lake do exist, for instance, a stonethrow south of the capital of Kharga Oasis. Although no Bohar Reedbucks rove through the reeds and rushes anymore, hunters are busy all year long gunning down waterbirds. Contemplating about such scenes one wonders, which species (extinct today in the oases of the Western Desert) would return to their former homes in the case of the absence of human beings and their efficient killing devices. Had Count Almasy in 1937 not claimed to have shot the last Waddan at Gebel Uweinat? When I traversed the Gilf Kebir in winter 2000/1, an individuum of this species approached my caravan, proving that expert opinion should not always be the last escape one must retreat to in order to understand the world. All judgements are of transitory nature. On Oct 22nd 2003 Marlies Kriegler and myself had discovered the first leg of the TK and MB. Where would this trail lead to? Would it be equipped with Muhattahs similar to MB, each of them positioned at a day´s marching distance by donkey? 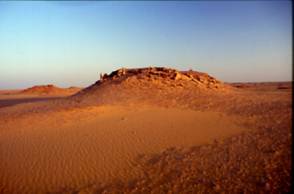 Toni Mills had suggested, that a 4th dynasty trail connecting Biar Jaqub with Dakhla Oasis, should lead to the region between El Hindaw and Qasr Dakhla, where the Canadian mission had found an important Old Kingdom Muhattah for caravans coming from or heading for Memphis. Departing from MB early in the morning, we set out to the East and traversed a region of rough limestone. It took time until we found a faint line of Alamat and, at midday, on higher ground, a Muhattah alloted to two hills. The site which is only 8,4 km away from MB is equipped with Khasins. One of them includes a grinding stone, the artefact giving reminisce of the luxurious outfit at MB. 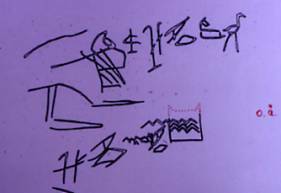 With reference to the name of the second scribe of Khufu´s expeditions at DWM I christened the site Muhattah Ij-Mery (MIM). The stone constructions (places of rest?) were erected on the northern side of the western hill, suggesting that this Muhattah served as a day´s half-way station. Continuing to the east we detected but a few alamat, until we descented into flat land consisting of white “fishbone”-sediments, sand and low dunes. 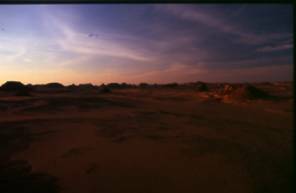 Before entering the plain expanse I searched a whole day for a muhattah, while Janine was herding the camels on a patch of dried bushes. 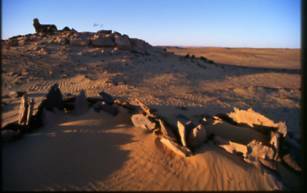 The muhattah was hidden in 16,7 km distance from MB and consisted of three sandfilled windsceens erected next to a “prominent” landmark distinctive only from the east (two rectangular shaped white rocks). In it´s surroundings quite an amount of stone tools and hearths as well as two house structures(?) were found. Surveying and herding the camels in total silence and solitude, we had the impression that at the time of Khufu´s expeditions the same place had served the donkeys for grazing after a day´s march. As there was no ancient name left to be dedicated to this Muhattah I christened the site Muhattah Janine (MJ). The terrain ahead of us was void of any road signs. If those had ever existed, they would have been swallowed by the sand. 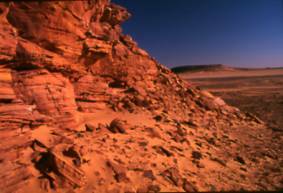 We crossed the expanse, and arriving at the most eastern dune, we sloped into a strech of land filled with numerous low sandstone hills. There, a set of alamat led us to an ancient Khasin. 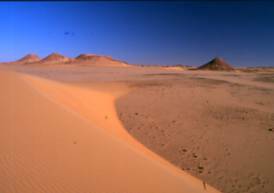 I had discovered the site in March 1999 and, because of it´s closeness to a pharaonic desert-patrol(?) station (nuqta; PDS) found in February of the same year, had named it Khasin-Nuqta (KN). 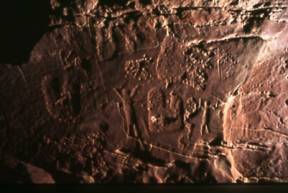 A number of stone constructions, pots-herds, ancient wasms similar to the potmarks etched into the Abu Ballas jars (here: carved into the rock) and a pharaonic figure (scratched on a sandstone slab), that bears some similarity to one discovered by Toni Mills, pointed to a late Old Kingdom date. Now, as we had succeeded in connecting the place with DWM via the Tariq Khufu (TK), it became clear, that the Khasin must have been approached by travellers and expeditions heading for Biar Jaqub already during the time of the 4th dynasty. The site lies 33,5 km due east of MB. From KN a faint line of alamat leads towards Mut el-Kharab. As soon as we had ascended a stretch of high land, we passed three limestone rock-outcrops to which the ancients had attached semi-circles of stone slabs. The constructions were sand-filled. This site, erected close to the rise, attests for the difficulties heavily loaded caravans had, when treading the very soft ground of the ascent. I named the site, which is located only 4,5 km to the East of KN, Khasin Musa Ibn Nusair (KMIN). We had run out of water. A city as busy as Mut we did not want to enter with the camels. So, after passing a stone circle, pot-sherds and a windscreen (14,9 km west of Mut el-Kharab), we left the TK and turned north to El Gedida. Half a day later we arrived at the newly drilled well of Bir el Dib about 4 km south of the village. From there we turned west in search of a second road connecting Biar Jaqub with Dakhla Oasis, a trail of which I had seen alamat north of MB (see first camel trip). At the entrance to the desert (1km west of Bir el Dib) we had passed a prominent hill scattered with pottery dating from Old Kingdom up to islamic times. Thereafter an area of undulating land was traversed, in which fragments of old roads were found, the larger part destroyed by modern quarrying activities. 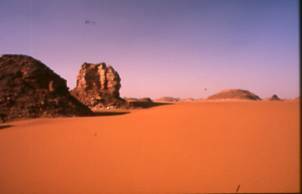 When reaching the eastern limits of the plain, which stretches from Gebel Edmonstone southward, our caravan was hit by a sandstorm. Leaving Janine and the camels behind for a day, I cut north-to-south along the fringes of the plain. Finally I came to three pyramid-shaped hills rising from the plain. At the foot of one of the hills five stone circles in groups of two and three had been errected, the area of the latter being filled with solid Abu Ballas-type pot-sherds. To our amazement this site, which I named Muhattah Abd el-Kasus (MAeK), is connected by alamat-fragments with PDS and KN, therefore, attesting for a “side-track” leading to TK. Most probably, supplies of water for TK were shipped from the area of Gedida via PDS to KN in ancient times. This trail is another example for a “lateral mode” of supply. In the vicinity of the western limits of the plain we searched three days in vain for a trail running parallel to TK and for the above road, which Toni Mills had proposed to have, possibly, existed. In the rising land west of the plain we finally found a number of very old windscreens and pottery, sites that, at this stage of the investigation, cannot be attributed to definite trails. Finally, we had to make a guess, which one of the sites could have belonged to the “parallel road”. Our assumption proved to be valid as (following the proposed direction of the parallel route to the west), we detected 2 mummified donkeys a few hours later. They had been covered by the dunes until recently. What good luck that the sand had given away, so that we were able to detect the beasts in all their splendor. As for their age one only can speculate. It would be a sensation however, if these animals had toiled in a caravan of the Kufu expeditions. Back in Biar Jaqub an attempt was made to identify a second ancient trail connecting Wilkinson´s 2nd Zerzura with the TAB. We found a faint line of alamat, a few pieces of pottery and resting places belonging to a road probably leading to Muhattah Arba´ Mafariq (MAM). We followed this road (faint donkey caravan tracks still to be seen in some places) for about 10 km, when a sandstorm lasting three days stopped further advances to the south-southeast. The road runs past a group of conspicuous hills situated along the western alignment of a plain containing fertile red playa. The plain is about ten kilometres in diameter and is positioned adjacent to Biar Jaqub. Later, I named the flat expanse Ard Chalil (AC), as my semi bedouine friend, who accompanied me on the fourth camel trip, dreamt of dwelling here one day and of running a farm. That AC is indeed in the process of being prepared for agricultural production, is proved by a number of land surveyer marks. 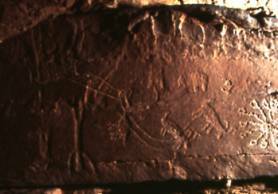 The notion that AC does not belong to the Biar Jaqub area, was attested by rock-art void of human figures, of which we found a quite sizable sample (3,5 x 2,5 m) representing (among others) giraffes; one of the beasts depicted at the moment when dropping her baby. The rock-face, which is bearing the scene, is oriented towards the plain, supporting the impression that, once upon a time, AC had been the habitat of the big mammals, and that this work of art was intended to mitigate the souls of the animals chased and killed by pre-historic hunters. The site, which is topped by a wind-screen (watch-out post), is 24,9 km distant from DWM. At the close of the expedition we surveyed the hills along the fringes of the big playa east-southeast of the field temple. 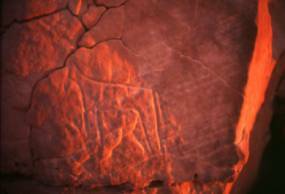 In this region two stone circle settlements, pottery and a remarkable set of rock-art sites (8) representing animals, human figures and abstract symbols, were found. 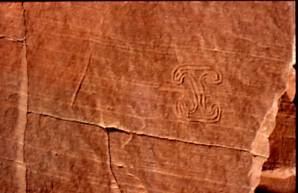 Were these symbols depicted by the same people, who had adorned Muhattah Jaqub with an enigmatic ornament? The sites are 11,5 km distant from DWM and 6,5 km from the field temple. We started our survey in the vicinity of AC. Next to the place, where Janine and I had been forced by a sandstorm to retreat and to give up our examination, Chalil discovered a set of 4 Claytonrings. From there we continued south-east in search for the proposed ancient trail to MAM. Soon we came to a solitary flat-topped hill (27,2 km south-southeast of DWM), on which 12 stone circles had been erected. At the foot of a fall of rock (a permanently shady place at the northern tip of the hill) we found pieces of pottery and a severely damaged dwelling. 2,5 km further to the south-southeast, at a conspicuous group of elevations, another Claytonring site and six stone circles on top of a high hill were detected. 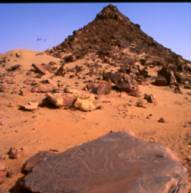 It is not clear, wether these sites and another locality 1,3 km further to the west, furnished with Sheikh Muftah pot-sherds (a huge, flat, solitary sandstone slab covered with enigmatic wavy lines and a few animals lay nearby and gave us the impression of a “sacrificial altar”), were stations belonging to our road. A fruitless search for it´s continuation followed. As temperatures rose, I decided to head immediately for MAM (in 19,5 km distance). After 13 km we came across a segment of faint caravan grooves, and 4,5 km later we traversed a clearly visible caravan-route running NE/SW. 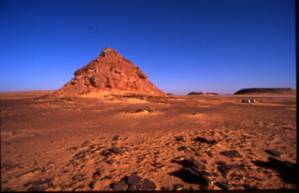 The road leads from a site (MAM-2) in 3,3 km distance, where, in November 2000, I had discovered Abu Ballas-type pottery, towards two low, flat-topped, white rock-outcrops (“mastaba-hills”) 1 km to the southwest, the easternmost “mastaba” adorned with sandals, a human figure, 2 animals (their figures crudely arranged in a circle) and a piece of rock-art of inidefinable symbolism. At this site it became evident, that an ancient road parallel to the TAB had been discovered. Wether this hitherto unknown trail combines with the TAB at certain muhattahs or wether it is a fully autonomous road, has yet to be analysed. I named the road-segment TAB-2. To make the wonder complete, two more modern(?) caravan routes (found in March 1999) probably dating to the islamic period, run parallel to the TAB. Fully occupied with the search for the ancient trail, I had paid no attention to them at the time of their discovery. 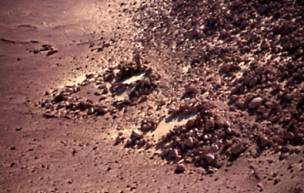 Does the TAB-2 traverse the desert about 2,5 km north of the TAB, the two “islamic” parallel routes (TAB-3 and TAB-4) do so about 1,5 km to the south. One can only wonder about the volume of hitherto unknown ancient traffic having traversed the vast void between Dakhla Oasis and the Gilf Kebir/Uweinat area. 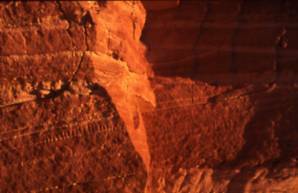 Most certainly, all those tracks continue to Ennedi/Lake Tschad Basin; a few alamat similar to the big road signs on the TAB having been detected southwest of Gebel Uweinat in northeastern Tschad. What was the purpose of, what caused the need for such burdensome trade routes? Would it not have been much easier for the ancient Egyptians to obtain their highly valued africana via the routes, which led along the Nile to Nubia? However, the caravan routes are there. And the supply-route from Biar Jaqub to the TAB is there as well. Only thorough investigation and profound archaeological excavation will untangle the riddle and give sound explanation for their existance. Exhausted from tremendous heat we arrived in the vicinity of MAM, where I had dumped 30 litres of water three years before. The supply was still there. 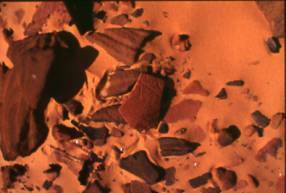 After temperatures had declined, our small caravan crossed TAB-3 and TAB-4, traversed huge concentrations of stone tools and remains of settlements (already known from former visits) and, finally, came to a rock-art site, which I had discovered on March 8th 1999. On the same day, on rising headland a few hundred metres south of the rock-art, a stone circle settlement was detected. 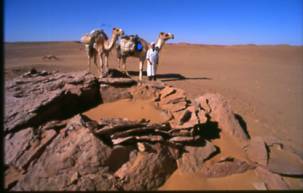 I sent Chalil with the camels to a patch of dried tamarisks nearby and studied the rock-picture, which measures 2 x 2 m.
Because of lack of water we had to hurry back to the north the next day (3/28/2004). At noon, a hot spell from the south, which lasted three days, hit our caravan. During this samum water consumption rose from 3,5 litres to 12,5 litres per day and person. Despite of the hardship we managed to survey the eastern fringes of AC and a few solitary hills at it´s southern end. 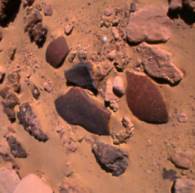 At the foot of a pyramid-shaped hill two structures of stone slabs and pot-sherds were found. 1,5 km northeast of this dwelling, at one of the “eastern hills”, a rockface had been adorned with a representation of a cow and a human figure. 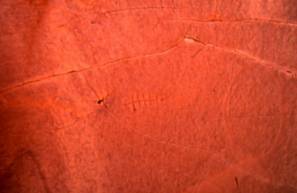 The discovery of the rock-art site caused us to search for settlement remains in it´s vicinity. We found an astonishing number of such sites on two flat-topped hills (40 + 8 stone circles) in 1,35 km distance. Another settlement containig 25 stone circles was detected on a solitary hill in midth of the southern section of AC . 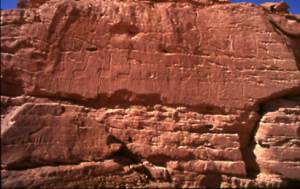 Close to this site (33,3 km southeast of DWM and 28,4 km distant from the field temple) we passed another isolated hill adorned with the most elabourately executed rock-art seen on this expedition. 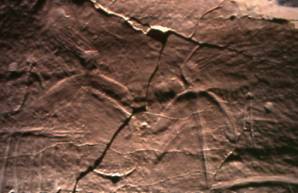 The picture measures 3,5 x 2 m.
On our way to Bir 5, by-passing DWM, a last discovery was made: four badly eroded depictions of donkeys in a line. As if the beasts were walking in a caravan of Khufu´s expeditions. 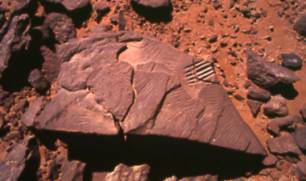 The rock-art site is situated 2,75 km east of DWM. It marks the beginning of TK. In addition to the arguments put forth in this report, I want to remind the reader of some further aspects and observations, that speak in favour of Biar Jaqub being an ancient “lost oasis”. 1. In an archaeological paper (Egyptian Achaeology, No. 23, Autumn 2003, pp. 25-28) Kuper and Förster report from their first field campaign at DWM. 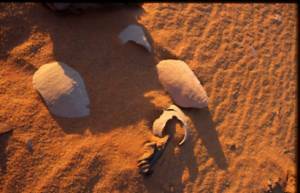 They disclose that Stan Hendrickx (a well-known ceramic specialist) has identified a small component of pottery (extracted from a trial trench) belonging to the Sheikh Muftah group, a late prehistoric unit of “Early Oasis Dwellers” known from Dakhla which continued into dynastic times. 2. The same report states that the pottery types excavated are almost exclusively restricted to cups, bowls and storage jars characteristic of the early Old Kingdom. About the number and the function of the storage jars no information is given. Barring future discoveries proving otherwise, it seems most improbable, that a sufficient quantity of water-storage jars (none of them, so far found, suitable for the storage of water; information obtained by personal communication with members of the excavation team) to be dug out in the future, will ever account for the water consumption of some 400 men of Khufu´s expedition. The lack of a sizeable quantity of jars, therefore, attests for a well at or in the vicinity of DWM. 3. 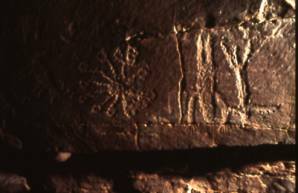 It is a remarkable circumstance that next to Ij-Mery´s and Bebi´s text the god Igai is depicted. According to K.P. Kuhlmann Igai was an Oasis God. Another opinion considers him to have ruled the Western Desert region as a whole rather than an oasis. 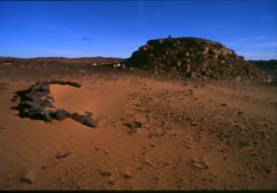 If the first view prevails: would one be allowed to interpret the occurance of an image of Igai as an indication, that DWM and it´s surroundings had been considered as part of an oasis by the two expedition leaders? If DWM and Biar Jaqub were not an oasis in ancient times, Ij-Mery and Bebi could have easyly depicted another god. 4. On this expedition a few water-mountain symbols have been found, which resemble the water-hole hieroglyph to a great extent, therefore supporting the notion, that such symbols were used for marking water sources in late prehistoric times. This winter´s explorations round up my research concerning TAB, DWM and Biar Jaqub to a single big discovery. P.S. : For reasons of protecting the newly discovered sites no expedition-map is attached to this report. 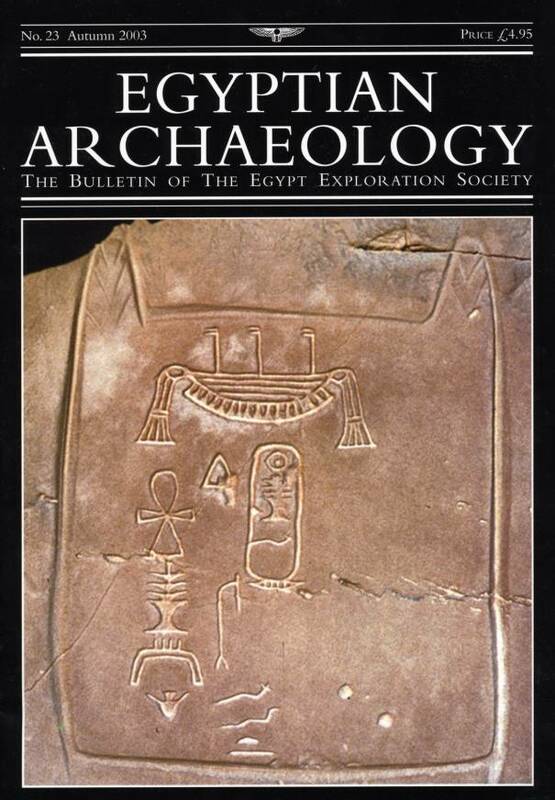 My discovery of Djedefre´s Water Mountain was published in Egyptian Archaeology No 23, Autumn 2003 pp. 25-28 by R. Kuper and F. Förster.